Gloucester overcame Cardiff Blues to set up European Challenge Cup semi-final at La Rochelle. A Gareth Anscombe drop-goal edged Blues 23-20 ahead after Gloucester Josh Hohneck was yellow carded. Alex Cuthbert had helped level the scores after the sin-binning, scoring his second try after Ross Moriarty and Tom Marshall scores put the hosts up. But unanswered second-half tries from Jonny May, Marshall, Mark Atkinson and Henry Purdy sealed Gloucester's win. The Cherry and Whites, who went out at home at the quarter-final stage last year, won the competition in 2015. Defeat for the Blues means they have failed to progress beyond the last eight of any European Cup competition since winning the continent's second-tier title in 2010. In a seesawing opening 40 minutes, scores were locked on four separate occasions, with Cuthbert and Moriarty trading tries before Blues' Steven Shingler and Gloucester's Billy Burns swapped penalties. More of the same followed when Billy Twelvetrees took over kicking duties from Burns, following a head injury, as both sides landed further penalties and Marshall's first try put Gloucester 20-13 up. However, Blues racked up 10 points while Gloucester were a man down to take a three-point advantage into the break. 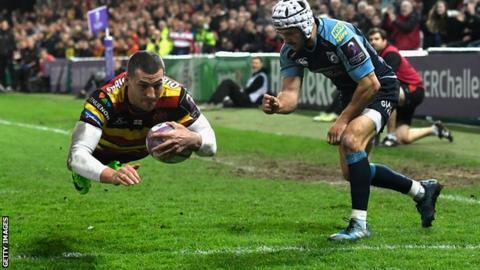 Shingler extended that lead to six, but that is as good as it would get for the Pro12 side, who had Wales' Sam Warburton at blind-side flanker after impressing in the position for Wales during the Six Nations Championship. England coach Eddie Jones was in the stands at Kingholm to see May, the only Gloucester player he called upon for their triumphant Six Nations campaign, cross for the first of the hosts' four second-half scores to seal an ultimately convincing win that sees them progress to play La Rochelle - a side they met twice and beat once in the group stage this term. Gloucester: Marshall; Sharples, Trinder, Twelvetrees, May; Burns, Heinz (capt); McAllister, Hibbard, Hohneck, Savage, Thrush, Moriarty, Rowan, Morgan. Replacements: Matu'u, Thomas, Afoa, Galarza, Ludlow, Braley, Atkinson, Purdy. Cardiff Blues: Morgan; Cuthbert, Lee-Lo, Shingler, Scully; Anscombe, Williams; Jenkins (capt), Dacey, Filise, Earle, Hoeata, Warburton, Navidi, Williams. Replacements: Rees, Domachowski, Assiratti, Cook, Bennett, Williams, Halaholo, Summerhill.